February 18, 2016Pluto’s ‘Hulk-like’ Moon Charon: A Possible Ancient Ocean? Images from NASA’s New Horizons mission suggest that Charon once had a subsurface ocean that has long since frozen and expanded, pushing out on the moon’s surface and causing it to stretch and fracture on a massive scale. The side of Charon viewed by the passing New Horizons spacecraft in July 2015 is characterized by a system of “pull apart” tectonic faults, which are expressed as ridges, scarps and valleys—the latter sometimes reaching more than 4 miles (6.5 kilometers) deep. Charon’s tectonic landscape shows that, somehow, the moon expanded in its past, and –like Bruce Banner tearing his shirt as he becomes the Incredible Hulk – Charon’s surface fractured as it stretched. 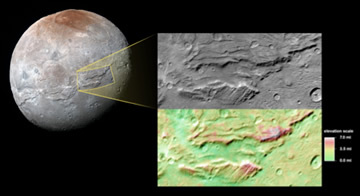 Charon’s outer layer is primarily water ice. When the moon was young this layer was warmed by the decay of radioactive elements, as well as Charon’s own internal heat of formation. Scientists say Charon could have been warm enough to cause the water ice to melt deep down, creating a subsurface ocean. But as Charon cooled over time, this ocean would have frozen and expanded (as happens when water freezes), pushing the surface outward and producing the massive chasms we see today. This image focuses on a section of the feature informally named Serenity Chasma, part of a vast equatorial belt of chasms on Charon. In fact, this system of chasms is one of the longest seen anywhere in the solar system, running at least 1,100 miles (about 1,800 kilometers) long and reaching 4.5 miles (7.5 kilometers) deep. By comparison, the Grand Canyon is 277 miles (446 kilometers) long and just over a mile (1.6 kilometers) deep. The lower portion of the image shows color-coded topography of the same scene. Measurements of the shape of this feature tell scientists that Charon’s water-ice layer may have been at least partially liquid in its early history, and has since refrozen. This image was obtained by the Long-Range Reconnaissance Imager (LORRI) on New Horizons. North is up; illumination is from the top-left of the image. The image resolution is about 1,290 feet (394 meters) per pixel. The image measures 240 miles (386 kilometers) long and 110 miles (175 kilometers) wide. It was obtained at a range of approximately 48,900 miles (78,700 kilometers) from Charon, about an hour and 40 minutes before New Horizons’ closest approach to Charon on July 14, 2015.